This showed up in my inbox in the past day or so. Note that there are a couple of K-12 distance, online, and/or blended learning articles below. Featuring pedagogical strategies, student outcomes, student behavior, and course instructional design principles. Email not displaying correctly? 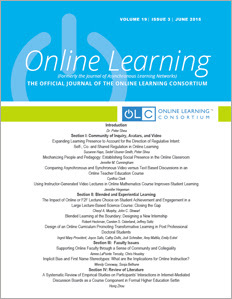 We recently published Issue 22:4 of Online Learning Journal (OLJ). Since 2016, OLJ has dedicated a special issue to publish the year’s best research from the American Educational Research Association’s Online Teaching and Learning Special Interest Group (AERA-OTL SIG). This year’s special issue presents a diverse selection of high-quality research on a broad range of topics using an array of research methods. The articles in this issue are arranged according to four major categories related to online learning: pedagogical strategies, student outcomes, student behavior, and course instructional design principles. This issue of Online Learning also contains seven papers from our regular submission process. The studies in this section examine student, faculty, and administrative issues in online learning. The initial set of papers look at preparing and engaging learners in online study. The second group of papers analyze questions related to faculty development. The final paper in this section presents a national study of online learning leaders.